Department of Geriathic orthopedics, Vitosha Hospital, Sofia, Bulgaria. The current work is given over to the particular purpose of revealing the principle and clinical outcomes of the novel method of Biplane double-supported screw fixation (BDSF), introduced in our Department of Geriatric Orthopedics in 2007. BDSF is a new method of internal fixation, designed to improve the internal fixation strength at intracapsular femoral neck fractures in the presence of osteoporosis, according to an original concept of the establishment of two supporting points for the implants and their biplane positioning in the femoral neck and head. The provision of two steady supporting points for the implants and the highly increased (obtuse) angle at which they are positioned, allow the body weight to be transferred successfully from the head fragment onto the diaphysis thanks to the strength of the screws, with the patient’s bone quality being of least importance. The position of the screws allows them to slide under stress with a minimal risk of displacement. The method was developed in search of a solution for those patients, for whom primary arthroplasty is contraindicated. Filipov O. The method of Biplane double-supported screw fixation (BDSF) at femoral neck fractures – principle and clinical outcomes. J of IMAB. 2013; 19(1):423-428. 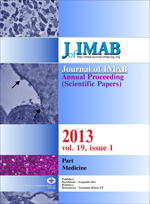 DOI: 10.5272/jimab.2013191.423. 11. Garden RS. Low-angle fixation in fractures of the femoral neck. J Bone Joint Surg Br. 1961 Nov;43-B(4):647-663. 14. Harris WH. Traumatic arthritis of the hip after dislocation and acetabular fractures: treatment by mold arthroplasty. An end-result study using a new method of result evaluation. J Bone Joint Surg Am. 1969 Jan;51A(4):735-755. [PubMed] Modified, Canale ST, Beaty J. Campbell`s operative orthopaedics, 11th ed., Mosby 2007. 27. Swiontkowski MF, Harrington RM, Keller TS, Van Patten PK. (1987) Torsion and bending analysis of internal fixation techniques for femoral neck fractures: the role of implant design and bone density. J Orthop Res. 1987; 5(3):433-444. [PubMed] ].